Angelgates all started with a prayer to get though the loss of my child. I sat up in bed rocking and praying to let go of the pain. That is when a beautiful light filled the room with a lady that said you are going to make angels. I did not understand and told Louis, my husband, and he said to pay attention to my dreams. When I did I saw an old fashion key hole. The guide said look though the key hole and see nothing but love. The angels are about 18” tall and shaped like a key and the wings are made out of satin and shaped like a heart. These are easy to hug in time of suffering to help the person know it's going to be alright. Making these angels have taken me on a wonderful journey helping in ways I never thought of. My angels do not have faces because the angels said to keep it plain. One day, a lady came to me very upset with her husbands drinking and wanted an angel. I made her an angel and she placed it on the mantel next to the tv. When she came home that night her husband said that her mothers face appeared in the angel and said stop drinking and he has not take one since. I made angels for a small child out of the grand parents clothes. The angels were given to the child as he waited for a heart transplant. I knew he was going to get the heart because as I made the angels the grandmother came in when I had her blouse and said that he would get one. When I receive the clothes I sit in silence and wait for them to tell me how to make the angel for you. I hand stitch the angels in silence and listen for their guidance. When someone is suffering I can not bring the person back, but out of the clothes I can give them a hug with heart felt love. When the angel is finished we name the angel from spirit. We named one before for a little girl who was dying. The angel's name was Christina when the mother went to a medium after the child had passed. They had cremated the angel I made with the child and when the medium said I have your child here and her angel Christina. I named an angel and put it in the store and a little girl came in the store and said mom grandma is on the shelf. When we pulled the angel down the name on the angel was her grandmother's. She left the store with the angel in her arms and that made my day. Each Angel is handmade to order and costs only $50 each. After purchasing please send an email to healerw@yahoo.com with your specific requests about your angel and we will make arrangements to make sure that your Angel is custom made the way you would like. Disclaimer: Spiritual healing and energy work are not a substitute for traditional Medical treatment, if you have a serious health imbalance please see a Doctor or other appropriate professional, and make complementary healing part of a complete health care program. Mediumship services are for entertainment purposes only. 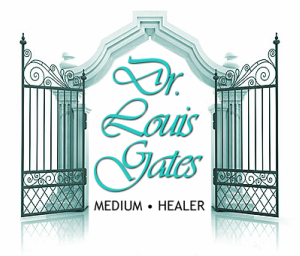 © Dr. Louis Gates No part of this web site may be reproduced without expressed permission.